Instead of trying to come up with a complete list of pistols that will fit in the BUGBite Holster we felt it would be faster and easier if we simply made a recommendation about what sizes work BEST. 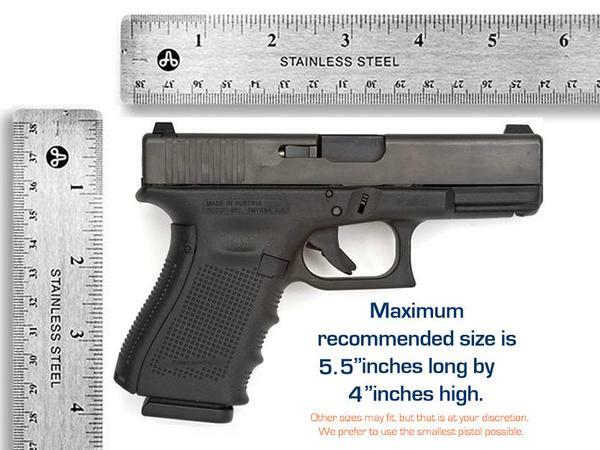 In our opinion, pistols shorter than 5.5" inches long and 4 inches high are best. For optimal results you should hold your pistol against your calf and see if it would be too big to carry this way. If it looks good to you and is inside our suggested dimensions then the BUGBite will work for you. The BUGBite holster will work with a snub nose revolver up to the same dimensions as noted above. With that being said, weight, shape, ease of draw, and comfort with the cylinder on your revolver really is about personal preference, much like any garment your own discretion will help you decide what is right for you. To return to the BUGBite product page, Click Here.